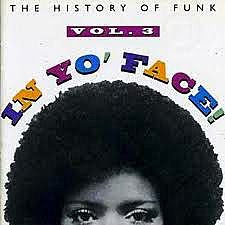 The third installment of the "In Yo' Face" series has a good helping of funk staples including such recognisable tracks as "Play That Funky Music", "P Funk" ( Wants To Get Funked Up ) and the soundtrack favourites "Jungle Boogie" and "Fight The Power Pt.1". Two of the lesser known songs that caught my attention were "The Jam" by Graham Central Station which has an especially cool opening section and "Funk Funk" by Cameo with it's freaked out bass and humorous lyrics. This compilation is much what you expect from your average "Best Of" collection, it does the job without covering too much new ground.